Having a vacation right now after classes and workshops in Tampere, Vaasa and Basel in June, we do have some summer workshops ahead. Last year we gave a milonga workshop in Hirvensuuli, Huittinen. This year in July we are going there to give a vals workshop. After classes there will be a milonga in a really cosy attic ballroom. 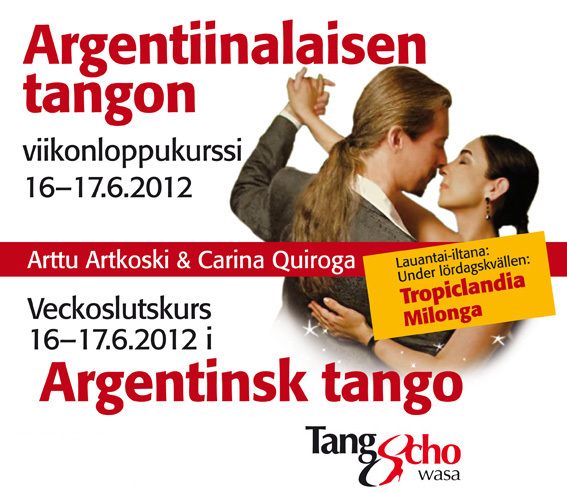 Last weekend of July will again be the summer tango festival in Varala, Tampere. First weekend in August we will go to Helsinki to give some private and groupal classes. In August we also go to Oulunsalo. We are also trying to find a place for weekly classes in Tampere. Classes in June were really nice and we’d like to continue them. Check our year 2012 for the dates if you are interested.